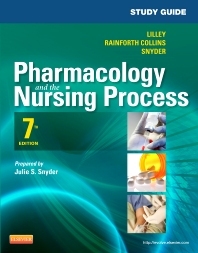 Study Guide for Pharmacology and the Nursing Process, 7th Edition, is designed to accompany the Lilley’s Pharmacology and the Nursing Process, 7th Edition textbook, preparing you for success in pharmacology and on the NCLEX Examination. Worksheets for each chapter include NCLEX-RN® Examination−style review questions, case studies, critical thinking and application questions, case studiesmultiple-choice questions, and other educationally sound rich learning activities. Application-based NCLEX Examination−style practice questions prepare you for help you understand how information in the book applies to real-life situationsproblem-solving in the clinical setting.